The Anatomy track consists of finding an alignment between the Adult Mouse Anatomy and a part of the NCI Thesaurus (describing the human anatomy). The task is placed in a domain where we find large, carefully designed ontologies that are described in technical terms. Besides their large size and a conceptualization that is only to a limited degree based on the use of natural language, they also differ from other ontologies with respect to the use of specific annotations and roles, e.g. the extensive use of the partOf relation. The manual harmonization of the ontologies leads to a situation, where we have a high number of rather trivial mappings that can be found by simple string comparison techniques. At the same time, we have a good share of non-trivial mappings that require a careful analysis and sometimes also medical background knowledge. The preliminary results for OAEI have been generated and are available now (28.09.2015). Link to results page. The anatomy track in 2015 consists of the default task to match the two ontologies of the anatomy track with the standard configuration of your matching system. In the past, we have evaluated matching systems with respect to their ability to exploit an input alignment (= partial reference alignment). We will include this modality of evaluation, in case it is requested prior to the final deadline by at least three participants. In case your tool offers such a functionality and you want it to be evaluated, please write a mail to the track organizers (mail see at the bottom of this page). The general schedule given at the OAEI main page is binding for the anatomy track. Moreover, you have to submit your wrapped tool as explained on the OAEI main page. (1) You can download the whole dataset and run your tests with this input data. (2) However, finally you have to wrap your tool against the SEALS client provided via the OAEI main page and run this client against the Anatomy testsuite. For this purpose, a tutorial is linked via the OAEI 2015 page. For running the Anatomy testsuite you will have to specify the following input parameters. We recommend to wrap and test your tool with the SEALS client at an early stage! We would like to thank Christian Meilicke for his help and advice. We would like to thank Martin Ringwald and Terry Hayamizu (Mouse Genome Informatics - http://www.informatics.jax.org/), who provided us with an intial reference mapping for the matching task of this track . We would like to thank Elena Beisswanger for improving the datasets with respect to several problems (see also ). In addition, we would like to thank all of the participants of the OAEI-2007 to OAEI-2011.5 anatomy track for hints and discussions with respect to the realization and evaluation of the last years. Even more, we thank the people that helped us in wrapping their tools for test purposes. This track is organized by Zlatan Dragisic, Valentina Ivanova and Patrick Lambrix. If you have any problems working with the ontologies, any questions related to tool wrapping, or any suggestions related to the anatomy track, feel free to write an email to oaei-anatomy [at] ida [.] liu [.] se. Oliver Bodenreider, Terry F. Hayamizu, Martin Ringwald, Sherri De Coronado, Songmao Zhang. Of mice and men: Aligning mouse and human anatomies. Proceedings of the American Medical Informatics Association (AIMA) Annual Symposium, 2005. Elena Beisswanger, Udo Hahn. Towards valid and reusable reference alignments - Ten basic quality checks for ontology alignments and their application to three different reference data sets. Journal of Biomedical Semantics, 2012. Jerome Euzenat, Christian Meilicke, Heiner Stuckenschmidt, Pavel Shvaiko, Cassia Trojahn. 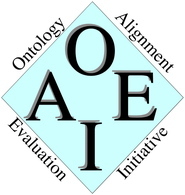 Ontology Alignment Evaluation Initiative: Six Years of Experience. Journal of Data Semantics, 2011.